It was an honor to win an award acknowledging the work we do in the community for breastfeeding. 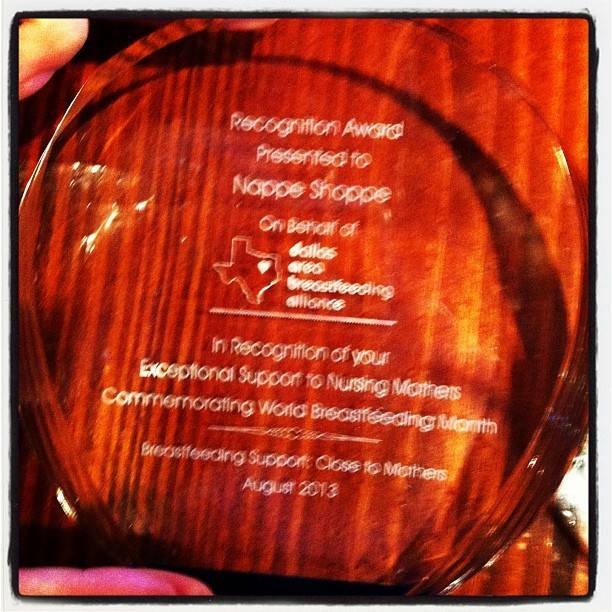 The Dallas Area Breastfeeding Alliance (DABA) on August 12th 2013 honoured Nappy Shoppe with an award for our support of Breastfeeding mothers in the Dallas area. The Dallas Area Breastfeeding Alliance is a non profit group. The mission of the Dallas Area Breastfeeding Alliance is to protect, promote, and support breastfeeding in the Greater Dallas Area. They work closely with WIC as well. In recognition of your Exceptional Support to Nursing Mothers. We received the award at a luncheon. And they ran a little video at the award.